… Because Zambia Is Greater Than Any Single One Of Us!!! 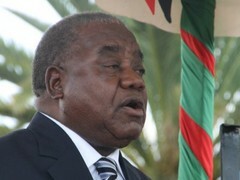 LUSAKA, June 2 (Reuters) – Zambia President Rupiah Banda, facing growing criticism over his anti-graft credentials, said on Tuesday he would not protect from prosecution any close allies that may be implicated in corruption. Chief government spokesman Ronnie Shikapwasha said a forensic audit conducted at the Ministry of Health, to ascertain the extent of corruption after senior officials stole $5 million, would be extended to all government ministries and departments. “There will be no sacred cows in the ongoing investigations regardless whether those involved are members of the ruling movement or indeed the opposition,” Banda said in a statement. Banda said he would not “shield anyone from being investigated or prosecuted once evidence is established”. Police have detained and recorded statements from 22 officials at the Ministry of Health over the case. Analysts say high levels of corruption in the government could dampen donor confidence and scare away foreign investors in a country previously regarded as a model of good governance in Africa. Sweden and the Netherlands last week froze $33 million aid for the health sector over the theft at the Health Ministry — initially stated as $2 million — forcing Zambia to cut expenditure for health programmes, including those for HIV/AIDS. Banda’s credentials in the graft fight had been undermined by his association with people accused of corruption, said Chileshe Mulenga, a research fellow at the Institute of Economic and Social Research of the University of Zambia. Former transport minister Dora Siliya was forced to resign in May following a public outcry after a high court tribunal said she breached the constitution in awarding a $2 million tender to a foreign company. Banda had earlier defended Siliya. “Donor confidence will definitely be eroded and if donor confidence continues to dampen due to corruption, then it will hit investor confidence,” Mulenga said.